The latest issue of Dengeki G’s magazine has revealed a brand new visual for the Love Live! Sunshine!! project. 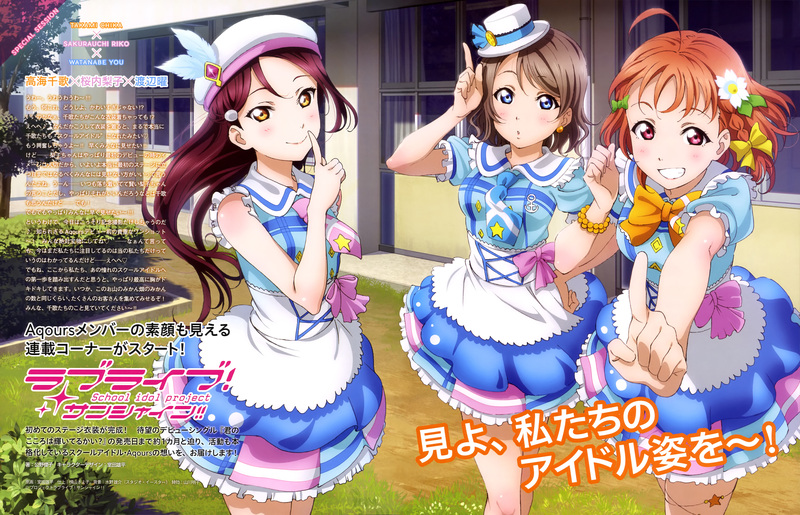 The new visual features three idols of Aqours: Chika Takami, Riko Sakurauchi and You Watanabe. The first promotional video for the album has been released. The video gives us a small listen of the album’s main song and also a look at the dance scenes and characters in motion. It has been earlier revealed that animation studio Sunrise, who animated the Love Live! School Idol anime, filed a trademark for Love Live! Sunshine!! on March 27th this year. The trademark was filed to cover the following areas that will utilise the name: Trading cards and related products, clothing, accessories and related products, and home console related products. Love Live! School Idol Project is an original anime produced by Sunrise studios that aired in January 2013. The conception of the anime project started in 2010 by Dengeki G’s Magazine. The editors wanted the project to be heavily influenced by fans, such as the costumes, hairstyles and names. Throughout this process, a manga of the project simply called Love Live! began in early 2012 by Sakurako Kimino and Arumi Tokita. The next part in the project was the anime series, followed by this app and an OVA. The second season of Love Live! School Idol Project aired last year and an anime film will be released this Summer. The school idol group in Love Live! Sunshine!! is Aqours and their debut song, Kimi no Kokoro wa Kagayaiteru kai?, will be released in Japan on October 7th. Further information about the project will be revealed in the next few weeks. Tags: #ラブライブ, 2015, Ai Furihata, Aika Kobayashi, Aina Suzuki, anime, Anju Inami, anniversary, announcement, april, April 2015, Aqours, Arisa Komiya, Dengeki G's Magazine, Dengeki G’s, idol, images, japan, Kanako Takatsuki, love live, Love Live! School Idol Project, Love Live! Sunshine! !, LoveLive, music, Name, Nanaka Suwa, new anime, october, Rikako Aida, Shuka Saito, sunrise, visual, アニメ, ラブライブ! School idol project, ラブライブ！ サンシャイン! !